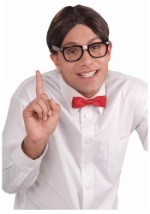 Rule the computer lab in this Mens Nerdy Geek Costume! 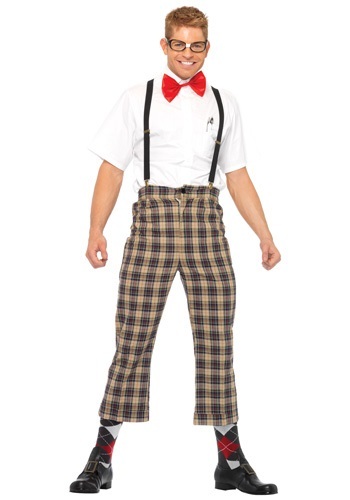 It includes pants, suspenders, bow tie, and glasses. 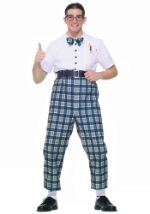 The high-water pants are 100% polyester plaid woven flannel in shades of brown and tan; they have a front zipper fly with a button closure, and a strip of elastic in the back of the waistband. There is a functional pocket in each side seam. 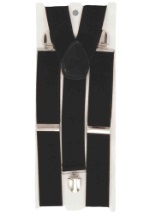 The suspenders are black nylon webbing and have silver-tone metal clips and plastic slides for length adjustment. The bow tie is red satin, on an elastic band whose length can also be adjusted. The black plastic glasses have a strip of white tape around the nosepiece. Add accessories like argyle socks, a plastic pocket protector and your own white shirt. 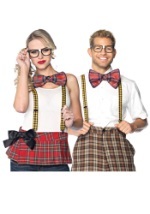 Geeks can be chic, too!